Trapper Jack is a character in the Saturday Supercade episode Hairy Parent. He is an animal smuggler who auctions off the animals he captures. 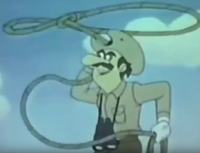 Trapper Jack first appears not long into the episode, where he immediately attempted to capture Donkey Kong on sight. However, upon realizing that Mario was also after Donkey Kong, the two clashed, causing Donkey Kong to escape despite Pauline's warnings. Trapper Jack attempted to create another trap for Donkey Kong, but clashed with Mario again after both realized that their traps were too similar to each other. Donkey Kong then jumpscared both of them into their own traps, running off again. He appeared again to capture Momma and take her to the auction. Donkey Kong tried to follow, but was ensnared in Mario's trap. Trapper Jack then appeared to take Momma and a disguised Mario to be sold off. Despite getting close to winning a fortune thanks to two top bidders, Donkey Kong managed to create a diversion to distract everyone. Trapper Jack eventually tried to escape when Donkey Kong commandeered a rhino. He was tackled by the rhino and knocked into a stream; when he surfaced and vowed he was not finished yet, a crocodile appeared and chased him away. Trapper Jack's exact fate is left unknown. Trapper Jack's name may be a play on crackerjack, which refers to being exceptionally good at something, hence his specialty at trapping wild animals. This page was last edited on March 22, 2019, at 23:54.